Nepal is considered to be one of the least-developed countries (LDC) in the World. In 2006, it had a Gross Domestic Product (GDP) of just USD 291 per capita. The economy draws heavily on the agricultural sector, which accounted for 39 % of the GDP in the fiscal year 2004/05. Agriculture, mainly carried out on a subsistence basis, is the main source of income for 80 % of the population. However, due to adverse environmental conditions production usually meets household food requirements only for an average of 6 to 8 months per year. Thus, 43 out of 75 districts in Nepal were classified as being food deficit with high rates of malnutrition in 2002/2003. The decade long conflict between the Maoist “Peoples Liberation Army” and the governments’ security forces (1996-2006) made the situation even worse. The remote districts of Rukum and Rolpa located in the Mid-Western Development Region are generally considered as the “heart land” of the Maoists and the major battle field of the insurgency. They suffered from the highest numbers of casualties and heavy damages to infrastructure. When FSRP started in 2004, Maoists controlled most parts of both districts. Locals were required to participate in regular campaigns (e.g. mass meetings, political training) and especially young men were frequently forced to join the Maoist armed forces. As a consequence, many young people left the districts. Government forces put additional pressure on local people, accusing them to collaborate with the Maoists. Many households were stuck between the lines for years, which complicated securing their livelihoods considerably and exacerbated chronic poverty and food insecurity. Efforts to support local people were constrained by the fact that government officials were not permitted to enter villages controlled by the Maoists. As a consequence, the physical and political presence of the government outside the district headquarters was very limited. Between 2004 and 2008 GTZ – one of the precursor organisations of the Deutsche Gesellschaft für Internationale Zusammenarbeit (GIZ) – implemented the “Food Security and Rehabilitation Project” (FSRP) on behalf of the German Federal Ministry for Economic Cooperation and Development (BMZ) in 31 conflict-affected communities (Village Development Committees, VDC) in Rukum and Rolpa districts. After the civil war ended in 2006, the German Government commissioned GTZ to foster the peace process. It continued and extended support to conflict-affected households in Rukum and Rolpa through the “Reintegration and Reconstruction Project” (ReRe), which was implemented between 2008 and 2010. In both projects the construction of rural roads served as a “backbone” of socio-economic rehabilitation and development. 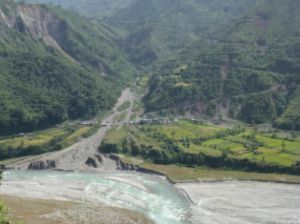 While the Rural Road Construction Strategy (see references) describes the road construction approach in general terms, this example provides more detailed information and lessons learned from the two successive projects in Mid-Western Nepal. It focuses on conflict-related and organisational features of the strategy. 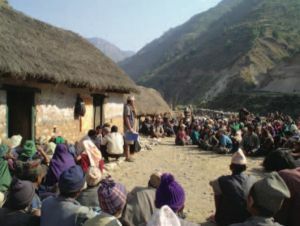 In addition to the conflict and its consequences, the population of Rukum and Rolpa districts suffers from extremely poor accessibility: Before GTZ started its efforts to extend the rural road network, the 400,000 inhabitants of Rukum and Rolpa relied on only 38 km and 33 km of fair weather roads, respectively. This low level of accessibility is a product of both the rough and cleft terrain of the middle Himalayas and political neglect. Due to the lack of road connections, access to markets as well as government and private services is very limited. Against this background and based on people’s demands and priorities, FSRP and ReRe supported the construction of a total of 65 km of rural “green roads” (see Construction Work According to the Green Road Approach on p. 11) over the course of seven years. This resulted in almost a doubling of the previous road network length. The roads were planned and constructed in an environment-friendly manner. Impact on environment along the road corridor was minimised by the use of local construction material, the re-use of excavated soils and stones and immediate re-vegetation of slopes. Through labour-based construction methods, FSRP and ReRe were able to mitigate chronic food insecurity in remote communities. In order to promote off-farm employment for beneficiaries in the short-term and the creation of additional livelihood assets in the long-term the construction of rural roads served as a “backbone” for socio-economic development. It was side-lined by complementary micro projects such as the construction and rehabilitation of schools, drinking water and irrigation schemes, on- and off-farm income promotion activities (e.g. fruit tree nurseries, vocational training and business promotion) and other social empowerment measures (e.g. non-formal education through learning centres, see references). The initial target group of FSRP were poor and conflict-affected households who lacked food security. Considering social exclusion and unequal access to resources as some of the root causes of the conflict, the project gave priority to women, dalits (people considered as “untouchable” according to the Nepalese caste system), disadvantaged ethnic groups, and unemployed youth. After the Comprehensive Peace Agreement (CPA) in 2006, the project team identified ex-combatants and internally displaced persons (IDPs) as additional target beneficiaries. Therefore, the subsequent ReRe project especially focused on encouraging these people to join project-related community-based organizations (CBO) and participate in the construction works. This section describes how the road construction schemes were implemented in Rukum and Rolpa. Following the basic project phases of preparation (I), planning (II), implementation (III), and operation and maintenance (IV), the section illustrates some of the most important road construction principles and procedures. During the preparation phase, the project area was identified in coordination with both conflict parties and other donors. In addition, the general road construction scheme was selected with active participation of all stakeholders concerned. 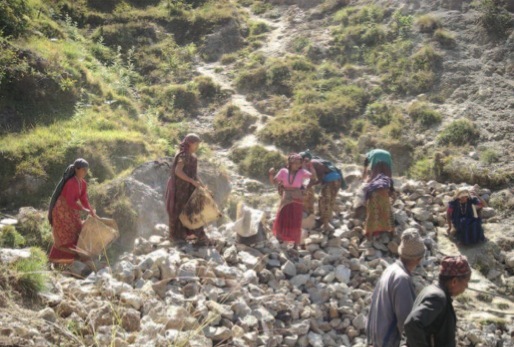 Because the major focus of the commissioned project was to support conflict-affected households, it was decided to implement the project in Rukum and Rolpa districts in Mid-Western Nepal. Both are considered to be the home base of the Maoist insurgents and the starting point of the insurgency. When FSRP started in 2004, the armed conflict had come to a head: government forces had lost control over major areas in both districts and the government’s sphere of influence was confined to the fortified district headquarters. In such a situation it was imperative to include both conflict parties into the project planning process from the very beginning. While FSRP and ReRe collaborated closely with government ministries and their respective district authorities, the project staff also established contacts to local Maoist leaders and informed them about every project activity. In order to maintain neutrality and to dispel any doubt of being involved in espionage on any side, FSRP staff shared the objectives and implementation mechanisms of the project in detail with both conflicting parties and sought their endorsements. This approach was vital for the safety and security of both, beneficiaries and involved staff. Having defined Rukum and Rolpa as the general project area, beneficiaries, the project team, and other stakeholders jointly selected a specific road construction scheme in each district. In Rukum and Rolpa the target communities identified the construction of rural roads as the priority activity. In order to integrate the project smoothly into already existing local plans, the project team consulted District Transport Master Plans (DTMPs) of both districts. The prioritisation of future road projects of the DTMPs was discussed with the beneficiaries and the concerned authorities (i.e. District Development Committees, DDC). Because of the tense situation in the conflict-affected districts, it was very important to make the selection process transparent, explain the final selection and the underlying criteria to both conflict parties and get their endorsement. Once the construction scheme was defined and approved by the central project management, the alignment of the road was defined, local staff members were recruited, community-based organisations (CBOs) formed and a Social Security and Maintenance Fund (SSMF) established. The planning process comprised field surveys and feasibility studies by which the technical teams identified an appropriate road alignment and verified the technical green road principles. These field surveys and studies were clearly enhanced by a strong participation of the beneficiaries who contributed valuable knowledge on local environmental conditions and areas affected by landslides and erosion. technical feasibility and compliance with technical requirements of the “Green Road Approach” (GRA): road gradient smaller than 10°, least possible destruction of productive assets and environment, etc. Considering all these criteria and the information available, alignments with a length of 34 km (Rukum) and 31 km (Rolpa) were defined. In view of the large number of criteria it is clear that sometimes it was difficult to meet all of them during alignment planning (see Box 1). Therefore, a careful evaluation of all criteria together with in-depth consultation of beneficiaries and other stakeholders is of major importance. In Rukum, beneficiaries and other stakeholders stressed the importance to seize maximum economic and social benefits by constructing the road. This required connecting the road alignment, which generally followed the course of a major river valley, with a traditional mule trail that lead from the valley bottom to one of the largest villages in the area, which is located uphill. Unfortunately, the intersection of the trail and the new road was located near a big active landslide (Photo 1, upper left corner). In addition, the area was prone to regular flooding. Before the road construction began, the land was not settled and used for agricultural purposes only. Shortly after the road was built, owners of the agricultural land started to rent out plots to people from neighbouring villages. These started to construct shops and tea houses. Only two years later a small bazaar (Photo 1, centre) was established on the hazardous land which is inhabited by more than 100 permanent settlers. The on-going armed conflict was a big challenge for the project implementation. In this situation, it was vital to have reliable staff members, who were willing to live in the conflict-affected and insecure area and who were able to uphold impartiality and independence from any conflict party. To support the project implementation under conflict-specific conditions and maintain transparency, FSRP developed a direct and participative implementation approach through target village organisational structures, which proved to be highly effective. To keep close contact with the target population, the project Teams chose to work in field offices outside the barricaded headquarters. By this, local people were able to visit the offices without going through tedious and humbling security checks. Even Maoists leaders could visit public project meetings which decreased mistrust from their side considerably. While a central project management was responsible for the overall management of financial and human resource issues, and for coordination with the partner government and other donors, a project team in each district facilitated road construction and corresponding side-project in the project area. Apart from staff for project management and accounting each project team comprised of staff responsible for technical support and social mobilisation, respectively. preparation of bills for labour payments. providing training to CBOs in project management, including participatory planning, monitoring, reporting and record keeping. Social mobilisers took a central role in the efforts to ensure transparency in the decision-making process and to promote ownership. Through public audits and meetings the project provided essential information to all stakeholders and accounted for resource use. FSRP and ReRe followed an implementation approach, in which CBOs take charge of managing the construction and maintenance of roads. This approach promoted self-help initiatives of the target groups and contributed to their further empowerment. Considering the length of the roads (>30 km in each district), the construction schemes were divided into several sections (4 to 6 km each) with largely independent management units. By this responsibility was spread on different CBOs. This section-wise construction proved to be extraordinary practical in managing extensive alignments and large numbers of workers. In a first step, User Committees (UCs) were formed – one for each road section. In Rolpa district, seven UCs managed the construction of 31 km of rural road while in Rukum six UCs managed 34 km of road construction, respectively. Each UC consisted of seven members: four managerial members (chairperson, vice-chairperson, secretary and treasurer) and three ordinary members. FSRP and ReRe ensured that women and marginalized groups participated in decision-making processes. According to principles of social inclusion, female members occupied at least 50 % of the UC seats, including at least two managerial positions. As a result in 2007, out of 91 UC members in Rukum and Rolpa districts, 43 were female and 48 male. In addition, 24 UC members were from dalit castes. Following the peace agreement in November 2006, the project adjusted its targeting: ex-combatants, internally displaced people (IDPs) and refugees were also encouraged to participate in project activities. Integrated committees were established, which helped to create an atmosphere conducive for reintegration and reconciliation. They strengthened the absorption capacity of the receiving communities. From 2006 on ten ex-combatants and IDPs were integrated into the UCs. delegating members to the Road Federation (RF) linked to the respective road scheme (see below). Technicians and social mobilisers of the project provided assistance and training in order to strengthen the capacities of UC members to fulfil their roles and obligations. However, in Rukum and Rolpa districts there were cases where UCs did not fulfil their responsibilities satisfactorily so that the beneficiaries nominated new UC members in a general meeting. In a first step each UC organised a meeting to select two representatives (one man and one woman) from amongst their ranks for the RF. With support of the project team the RF developed operation and maintenance policies as well as by-laws (guidelines) for the utilisation of the fund (see Box 3). Furthermore, the project team oriented the RF about social security, fund raising and the roles and responsibilities of the federation. Then, supported by the social mobilisers, each federation selected five to seven members (50 % women representation and an adequate representation of dalits) to from a Social Security and Maintenance Sub-Committee (consisting of a chairperson, vice-chairperson, secretary, treasurer, and ordinary members). This sub-committee was responsible for administration and management of funds. Finally, the committee selected two signatories (at least one woman) for banking transactions. For the duration of the project, such transaction needed an additional compulsory signature of a member of FSRP’s/ReRe’s project team. FRSP and ReRe took great effort to develop management capacities of CBO-members and to guarantee participation in decision-making processes throughout the whole project period. A basic principle of the “Green Road Approach” (GRA) is that the beneficiaries have to make the land available which is needed for road construction. The project paid no direct compensation in cash or kind to the landholders – an approach, which inevitably leads to land disputes in the beginning. The lead-role in solving such conflicts was taken by the CBOs, which represent the beneficiaries as the final road owners. Nevertheless, the project’s social mobilisers supported the CBOs by providing training and facilitating discussions with worried land owners. Solutions to land disputes were based on consensus and sometimes comprised indirect compensation through services provided in side-projects (see Box 2). 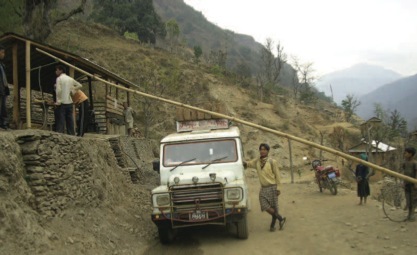 In 2004, FSRP began to support the construction of the Sulichaur-Uwa road in Rolpa district. The road crossed through about 100 m of land belonging to Mr. Budha. He naturally began to oppose the road scheme and expressed that he would not allow anyone to construct a road right through his land, unless he was adequately compensated. Members of the User Committee (UC) of the respective road section discussed the problem with FSRP staff members and decided to negotiate with the land owner offering him the following solution: They convinced Mr. Budha that the price of his remaining land would increase considerably once the road was constructed. Selling some land as building plots he could easily compensate the loss of land. Additionally, he was offered indirect compensation through agricultural support from FSRP’s supplementary micro projects (support for vegetable seeds and fruit saplings, water pipes for irrigation, and agricultural skills training). This convinced Mr. Budha, who finally agreed to contribute his land for the road. With the fruit saplings provided by the project, he planted more than 50 fruit trees. In addition, vegetable sales provide a return of more than 60,000 Nepalese Rupees (NPR, in 2004: 1 NPR ≈ 1.30 USD) a year. Based on this success he acquired respect from the villagers and FSRP selected him as an exemplary farmer for the area. Furthermore, Mr. Budha became a resource person to resolve similar disputes in other villages within the district. Constructing a road in difficult terrain is a difficult task so that accidents may occur. In order to prepare for such accidents, a Social Security and Maintenance Fund (SSMF) was established jointly by beneficiaries and FSRP/ReRe. The fund was built up through the project’s contribution of 1 Nepali Rupee for each kilogramme of rice distributed to the workers. The money was deposited in a special bank account for the compensation of victims of accidents. After three and a half years of construction, the funds of Rukum and Rolpa districts amounted to 2.7 Million NPR (≈ 35,000 USD). Its resources were used according to clear procedures, which were formulated (see Box 3). After the completion of the road, the RF was able to use the remaining deposits as a financial basis for maintenance works. Compensation was paid to victims of accidents in case of physical disability during work or to the victim’s next dependants in case of death. The Road Federation (RF) decided on the provision of compensation for differently-abled workers according to their respective by-laws. Step 1: When the accident occurred, Worker Group (WG) members immediately informed the responsible User Committee (UC) of the respective road section, which fulfilled all legal formalities. Step 2: After the completion of the funeral rituals, the UC provided the RF and FSRP/ReRe with evidence regarding the incident. Step 3: Against this evidence, the RF with support of the project team decided on the level of compensation according to the by-laws and made available 40,000 NPR per death case to the victim’s family as standard compensation. Besides this formal regulation, UCs and workers also showed great flexibility dealing with these sorrowful situations. 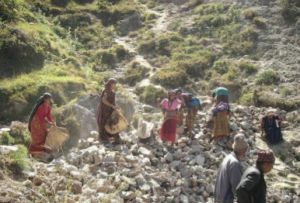 On the Nathigad – Baluwa road section in Rukum, for instance, besides the 40,000 NPR paid from the fund in compensation to the dependants, worker groups collected voluntary donations of 5 kg of rice per worker to provide a total of 1,100 kg of rice to the victim’s family. In 2004, one local Maoist leader was expecting more money to compensate for the death of his wife with the argument that she had small children. Eventually, the RF with support from the project team convinced him that everyone’s life is of equal worth. Finally, he accepted the standard compensation amount of NPR 40,000. Actual construction work started in the third project phase. In the beginning of this phase Worker Groups (WG) were formed, equipped and trained. With guidance of technicians and local supervisors, WG were then able to construct the road according to the “green road” principles. Payment of workers was based on achieved outputs and jointly managed by the project team and CBOs in a transparent manner. Before construction began, UCs divided their respective road section into several sub-sections. Each of these had to be constructed by a specific WG consisting of 10 to 15 workers. FSRP/ReRe invited people from households living in VDCs along the road corridor to work on the road. In addition people from adjoining and remote VDCs that were identified as particularly food insecure and conflict-affected were also invited. In its attempt to support especially marginalised and disadvantaged groups, FSRP/ReRe encouraged road users to compose WGs in an inclusive manner. It was ensured that women and marginalised groups (members of dalit castes and ethnic minorities) had equal access to employment. Following the CPA in November 2006, the projects adjusted its targeting. Ex-combatants, internally displaced people (IDPs) and refugees were also encouraged to participate in WGs so that they could create individual social and economic assets. In the project areas the reintegration approach was managed with ease, because the total number of returnees did not exceed 20 % of the total number of beneficiaries. Mixed WGs in terms of caste, gender, age, ex-combatants, IDPs, etc. were promoted. However, FSRP/ReRe also successfully supported the formation of exclusive women groups, in cases of the risk of mockery and harassment by male workers. One adult member per household in the target VDCs was entitled to work in the FfW/CfW road scheme. Children below an age of 16 were strictly prohibited from work. Special considerations were given to female headed households with no other adult members. The project provided equal opportunities for all willing participants regardless of faith, gender, caste, ethnicity and age (except for children, see above). FSRP and ReRe trained the WGs in construction skills like masonry and other infrastructure related techniques. These skills were mainly needed for the road construction but are also used for other productive activities (e.g. building of houses, maintenance of terraced fields) since the project has been phased out. The work on the construction site followed the “Green Road Approach” (GRA). The most important provisions are summarised below. For more detailed information please refer to the Example “Community-based Road Construction for Livelihood Improvement in Bajhang and Baitadi, Far-Western Nepal” (see references). Use of local materials (see Photo 3) and equipment. A special challenge for project implementation was posed by the tense political situation. Frequent bandhs (general strikes) time and again stopped the transportation of people, food, and materials and thus interrupted and delayed the project implementation. the stabilisation of living conditions of conflict-affected households due to cash payments, which enabled them to satisfy individual needs, reinvest in productive assets (e.g. livestock, land), repay debts, send their children to school and save. While the provision of rice increased the availability of food in the short-term, the cash-component expanded the impact of the project as local traders and businesses benefited from increased consumption. To reinforce and strengthen the development of local market centres in Rolpa, FSRP and ReRe conducted labour payments directly along the road corridor. skilled labour: masonry and the construction of retaining structures (gabion boxes, dry packing and dry stone walls) and culverts. Food and cash incentive for unskilled labour: FSRP/ReRe provided wage of 2 kg of coarse rice and 40 NPR per unskilled labour day, based on a daily work norm consisting of eight working hours (Person days, PD). The incentive rate of 120 NPR, was defined according to the FfW guidelines of the United Nations World Food Programme (WFP) Nepal. Quantitative measurement of PD was based on norms defined by the Department of Local Infrastructure Development and Agricultural Roads Nepal (DoLIDAR). Due to the performance-based measurement system, workers earned on average 3 kg of coarse rice and 60 NPR per day (equivalent to 1,5 PD). Cash incentives for skilled labour and transportation costs: FSRP/ReRe paid skilled labourers in cash based on average local market rates (between 200 to 250 NPR per day). 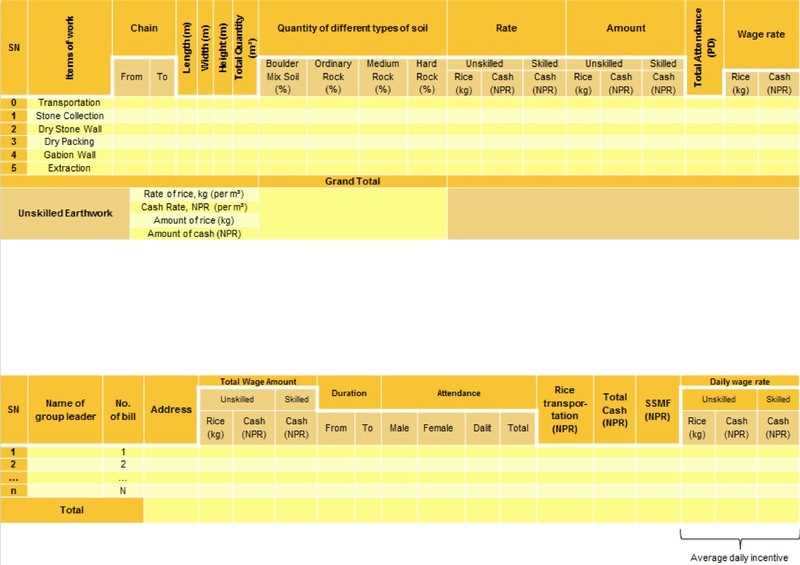 Similarly, rates for transportation of food and non-food items were calculated according to local market rates. Again, the quantitative measurement of skilled labour was based on DoLIDAR work norms. Food and cash remuneration for supervision work: UC members and on-the-job trained local supervisors received 3 kg of coarse rice and 60 NPR for their managerial and supervision work per day. Step 1: Once the suppliers had delivered the coarse rice to the agreed delivery points, FSRP/ReRe managed food transportation to its own warehouses in the districts (final delivery point) by using locally available means of transportation (e.g. tractors, jeeps, porters, mules). Step 2: The district coordinators of FSRP/ReRe approved the work valuation documents (see Figure 1) submitted by the FSRP/ReRe field technicians. These documents entailed calculations of food and cash entitlements for the beneficiaries, based on the work accomplished. Step 3: Following the approved work valuation documents, ReRe/FSRP issued food coupons to the leaders of the respective WGs through the responsible UCs. The group members presented the food coupons at the project warehouse and received food including the cash required for the transportation of food from the warehouse to their village. WGs were free to decide whether to transport the rice themselves or to commission its transportation (mules, porters). In order to ensure the ability of people to carry or organise the transportation of food, iterative payments (small amounts within shorter periods) were provided. Furthermore, FSRP/ReRe staff monitored to ensure that food earned by workers was not sold or converted into cash. Step 4: Cash incentives were paid by FSRP/ReRe through the concerned UCs using the banking system available in the district. Due to the absence of an adequate system in Rolpa, FSRP/ReRe paid the cash directly to the workers through the UCs and kept the payment records individually. Food and cash transactions were recorded in food ledger books. In both cases, payments took place in public, thus ensuring transparency and accountability. Since the project phased out in 2010 the beneficiaries are responsible to sustainably manage and maintain the roads. Therefore, FSRP and ReRe emphasised beneficiaries’ road ownership and a feeling of responsibility for them from the very beginning. To encourage a sound maintenance system, the beneficiaries were supported financially and technically in institutionalising a Social Security and Maintenance Fund (see above). It is likely that 200 to 300 PD per year will have to be invested for maintenance works of one km. To manage maintenance activities adequately, the Road Federations in Rukum and Rolpa formed a maintenance sub-committee, which adopted rules and regulations for decision-making with respect to maintenance works and the use of the fund’s remaining resources. The sub-committee also took over the responsibility to raise additional funds to ensure the long-term maintenance of the roads and financial liquidity. These fund-raising activities were supported by the project team with the objective to generate additional local resources and a steady base of income for the fund. In Rukum, one officer of the DDC was elected as a member of the RF, thus, promoting financial support from the local authorities. In 2008, the DDC of Rukum supported the physical extension of the initial road alignment for an additional 4 km with an investment of 1.5 Million NPR. The district also pledged to support the maintenance of the road financially. In Rolpa, the RF established a tolling system in 2007. It charges motorists a service fee of 15 NPR for using the road (both ways) (see Photo 4). To minimise maintenance requirements, FSRP/ReRe promoted structural measures which reduce erosion and landslides (e.g. gabion boxes, retaining walls, bio-engineering) and ensured that roads were closed during the monsoon and used by light vehicles only. These simple regulations can prevent excessive destruction of the road surface, which may be a starting point for larger damages. The number of direct beneficiaries, who gained short-term employment opportunities during road construction, was about 6,300 individuals out of 6,000 households with about 34,000 family members in total. The total number of direct and indirect beneficiaries was estimated to be about 120,000 persons, or almost 30 % of the combined populations of Rukum and Rolpa. Beneficiary households (HH) contributed on average 90 days of labour to the construction of the road. Given the fact, that workers earned an average of 3 kg of coarse rice and 60 NPR per day, 90 working days were equivalent to 270 kg of coarse rice and 5,400 NPR. Based on an average HH size of 5.6 persons and assuming that the HHs had access to food during the lean season the wage contributed to roughly 50 % of the food and cash requirements of each HH for a period of four months. Table 1 provides an overview of the project inputs in Rolpa. Transportation costs decreased by 20 % and transportation of agricultural products from the project area to the markets increased significantly. The nutritional status of participating households were improved by 25 % according to the perception of beneficiaries. This does not include the food and cash provided by the project as incentives in the scope of FfW/CfW. Vehicles can ply the roads during the dry season, which helps people to travel out and in to the districts. Pedestrians and mules use the roads all year round. Business increased along the road corridors and further market centres developed. Temporary emigration was reduced since people gained labour opportunities in the districts. Similarly, the prospects for earning and living in the villages increased and people have become progressively motivated to invest their earnings in productive assets. It is expected that seasonal migration will not rise in the future. Especially the self-esteem and pride of the youths increased since they earned income in their home districts instead of working in other countries. During the conflict, especially the youth left the districts to avoid recruitment by the Maoists. Due to their involvement in construction works there was no time to be “involved in conflict” any more. While working with the CBOs, the project was able to empower beneficiaries to negotiate with the conflicting parties. By organising people in various committees for different activities, FSRP/ReRe promoted the establishment of basic democratic structures at the local level. The project contributed significantly to building trust among community members by facilitating them to work in groups. This led to mutual respect and confidence and increased social harmony. “Low caste” and “high caste” members worked, ate, and drank together – bypassing the concept of “untouchability”. Also it was observed that local disputes and gender discrimination decreased. Meetings of the project team held in the field build trust among all conflict parties. If meetings can be visited at any time there is less suspicion and everyone has the opportunity to voice dissatisfaction openly. Small and integrated groups of participants lead to changes in beliefs and attitudes due to social interaction and group dynamics during the construction process. Furthermore, the group approach ensured inclusiveness as well as exchange and dialogue. It reduced social discrimination and supported empowerment of disadvantaged groups and the process of reintegrating ex-combatants and IDPs. Fixed incentive rates based on measures outputs encouraged female workers to work for at least half a day. In the first half of the day, women were generally involved in household chores (cooking, feeding children, cleaning dishes, etc.). Once women started to earn money and hold decision-making positions in the committees, they gained respect from the community and within the families and improved their social status. 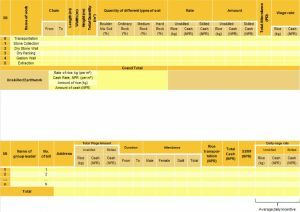 The severe food deficit in the project area and self-targeting allowed fixed incentive rates at low levels. FfW and CfW measures improved people’s food security in the short-term. To boost food security in the long run it was crucial to support poor people in using their entitlements more effectively. This required a good understanding of the available potential resources and market demands, as well as constraints poor people face, to access markets and utilise local resources. Based on this knowledge, the road construction works and accompanying support measures have to complement each other. Public audits helped to build trust between workers and the project, which became a “foundation” for other development initiatives. The system of transparency helped creating a feeling of ownership and responsibility among the beneficiaries. When workers were assured that the fund would be utilized for their social welfare, they were more than willing to contribute to construction works and the fund. The utilisation policy and criteria of the fund have to be developed with the prior consent and understanding of the users. 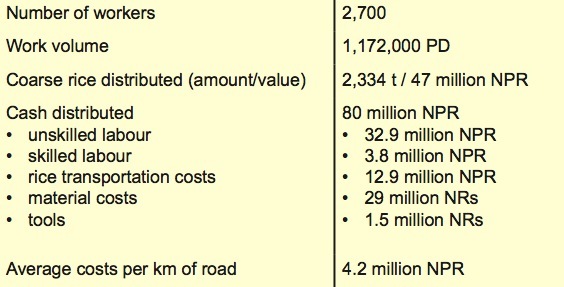 The length of the road scheme should be defined based on the needs, available resources and environmental conditions. It should not be too ambitious to avoid a situation where its construction cannot be completed within the project period. Road construction must begin simultaneously on hard rock and soft earth to avoid delays in working on the difficult parts. To reduce construction costs and to complete the road within the envisaged period, it may be sometimes unavoidable to outsource more sophisticated works to outside contractors with appropriate technical equipment (e.g. pneumatic drilling machines). Such decisions should be based on thorough technical assessments. Infrastructure works should fit into governmental infrastructure and transportation master plans at national, regional and local levels to ensure future utilisation and probable extension. To ensure long-term maintenance and sustainable utilisation of the road, it should be thoroughly assessed whether handing it over to local government bodies is the most suitable option. Other alternatives are the integration of government officials in the community-based maintenance committees or a legal entitlement of beneficiaries to fully control road movements, repairs and maintenance.